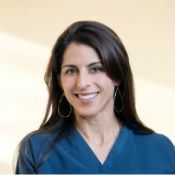 Amy Sedgwick MD, FACEP, E-RYT is a senior Yoga Medicine teacher. “Patient to trauma room one, patient to trauma room one, stat!”…an overhead page that is all too common in my line of work. These patients come to me with hip and long-bone fractures, acute mental status changes due to brain injury, skin tears and lacerations, and many other life-threatening injuries. As yoga professionals, we are in a unique position to address some of the underlying causes of falls that occur so often among seniors. The benefits of strength and balance training are, of course, cited frequently in the medical literature. These, combined with the breathwork and relaxation specific to a yoga practice, can provide a regimen that offers an individual physical strength and stability as well as a sense of well-being and enhanced quality of life. When I am treating a patient for a particular problem, I often find it helpful to check in with the latest medical literature so that I know what kinds of things my colleagues have found effective in treating similar patients. While I believe it is good to review the literature, however, studies vary widely in their strength and validity, and if one is not used to reading medical literature critically, it is easy to be led astray by apparent “good” results that are based on poor research methods. My hope, as both a practicing physician and yoga teacher, is to empower you with the same kind of evidence that medical providers rely on before prescribing a treatment plan for patients. There has been a fair amount of research conducted on how to prevent falls in the elderly. Studies looking specifically at yoga regimens occupy a smaller subset of this literature, and the biggest criticism I found in my quick review was that the size of the study populations have, to date, been quite small. Still, I think the papers I review below may be helpful as you think about promoting yoga for seniors. At the very least, realize that what you are offering is more than just a simple yoga class. In fact, you may be the link in the chain that prevents the next fall! Other meta-analyses (studies that evaluate a group of similar studies looking for common outcomes) show more modest evidence that yoga, in particular, is superior to other forms of physical-activity-related interventions in elderly people.7 Patel et al. did a meta-analysis looking at studies from 1950 to 2010 and found 18 relevant studies looking at older adults across a range of settings. This meta-analysis suggested yoga improved the participants’ sense of good health, aerobic fitness, and strength. Realizing that there are no perfect studies proving that what we do as yoga teachers helps these folks avoid falls, I do think there is a legitimate growing body of evidence suggesting that yoga can help our elders achieve increased strength, stability, coordination, and well-being. In my mind, that is better than any drug I have ever heard of—and certainly better than the injury, disability, and death that can result from preventable falls. I encourage you to continue to target this age group, and I hope you realize what an important contribution you can make toward improving the health and well-being of older people by offering accessible yoga classes for seniors! Rather than a new drug or quick fix, it is the small, daily, purposeful things we do with integrity that often bring about the most meaningful change. This is yoga. Good luck and namaste, beautiful yogis! 1. Lord SR, Ward JA, Williams P, Anstey K. Physiological factors associated with falls in older community-dwelling women. J Am Geriatr Soc. 1994; 42:1110–1117. 2. Rossat A, Fantino B, Nitenberg C, Annweiler C, Poujol L, Herrmann FR, Beauchet O. Risk factors for falling in community-dwelling older adults: which of them are associated with the recurrence of falls?, J Nutr Health Aging. 2010 Nov; 14(9):787–91. 3. Tiedemann A, Shimada H, Sherrington C, Murray S, Lord SR. The comparative ability of eight functional mobility tests for predicting falls in community-dwelling older people. Age Ageing. 2008; 37:1–6. 4. Alexander BH, Rivara FP, Wolf ME. The cost and frequency of hospitalization for fall-related injuries in older adults, Am J Public Health. 1992 Jul; 82(7):1020–3. 5. A Tiedemann, S O’Rourke, R Sesto, C Sherrington, A. 12-Week Iyengar Yoga Program Improved Balance and Mobility in Older Community-Dwelling People: A Pilot Randomized Controlled Trial, J Gerontol A Biol Sci Med Sci. 2013 September; 68(9):1068–1075. 6. K Kelley, EdD, PT, NCS, D Aaron, BS, SPT, K Hynds, BS, SPT, E Machado, BS, SPT, and M Wolff, BS, SP. The Effects of a Therapeutic Yoga Program on Postural Control, Mobility, and Gait Speed in Community-Dwelling Older Adults, J Altern Complement Med. 2014 Dec 1; 20(12):949–954. 7. Patel NK, Newstead AH, Ferrer RL. The effects of yoga on physical functioning and health related quality of life in older adults: a systematic review and meta-analysis, J Altern Complement Med. 2012 Oct; 18(10):902-17.